“Marilyn Monroe’s aura (II.31), After Warhol’’ by Anna Von Mertens. 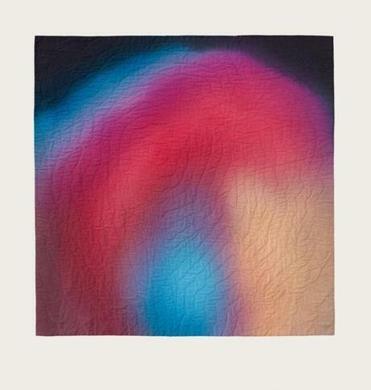 Conceptual quilt artist Anna Von Mertens invites viewers to peer at history through uncommon lenses. Often, in her show at the Boston Center for the Arts, Mills Gallery, she broadens the view, setting human events against the movements of constellations, or the incremental growth of a tree over centuries. A matched pair of quilts frames two catalyzing moments in American history. “ ‘Gold! Gold! Gold From the American River!’ (Sunset, January 24, 1848, Sutter’s Mill, Coloma, California)” and “Black Gold (Sunrise, January 10th, 1901, Spindletop, Texas)” chart the stars appearing at dusk the day the California Gold Rush began, and the stars gleaming as dawn approached the morning the geyser blew that sparked the Texas oil boom. Given the frenzy of each event, the images are strangely still. Von Mertens stitches the actual arcs of the stars through those two skies — one, a coppery, sunset gold; the other, inky black dusted with the gray of morning. The quilts have the proportions of an old film Western, and with them the sense of broad horizons, unending possibility, and the risks that come with wild potential. In another group, the artist re-creates the rings of ancient trees. As with the stars, these depictions are not guesswork. Von Mertens worked with scientists who study samples from such trees, investigating connections between climate and human unrest. The decline of the Roman Empire, the Black Death, and the Anasazi migration in the 12th century, the artist reports, can be mapped against periods of drought. These are the starkest and yet the most understated pieces in the show — all black, save for pale stitches. Where there were cracks in the wood, or samples removed from it, Von Mertens leaves areas quietly, yet dramatically, unstitched. She conveys the slow crawl of time, as insistent as a watch ticking; it’s also the backdrop against which untold numbers perished and an empire fell. The artist ventures out of hard facts for a third body of work, for which she hand-dyed her cotton to create the auras of the subjects of iconic portraits: Whistler’s mother, Warhol’s Marilyn. She stitches their outlines and their chakras. If this sounds a little woo-woo, consider that an accomplished portraitist gleans and crystallizes in paint something equally intangible in his or her sitter. Von Mertens enters that feeling realm, exploring the intimacy between artist and subject, and what of life is left on the canvas. These works push portraiture toward abstraction, but they’re slipperier than those hinged to science, prettier but ultimately less navigable and ambitious than the daunting turn of the eras captured in the rest of the show. British artist Richard Forster has called his work “photocopy realism.” He and Meg Alexander, who have a small, razor-sharp show at Drive-By Projects, make exquisite drawings that excavate the paradigm of the artist’s hand versus mechanical reproduction. Forster further deepens the theme of copying by taking Levittown, with its identical ticky-tacky houses, as his subject matter. He finds aerial photos of the postwar insta-neighborhoods on line, photocopies them, and uses those images as his source for drawings. Several drawings in the “Levittown Variations” series play up the smudges of a poor copy; the streets and houses give way to larger patterns of shadow and gullies of light. Abstractions unfurl beneath each picture, fashioned after pages that ran through a copier with nothing in the copy bed. Streaked and grainy, like static on an old television, each one different, these suggest there is no such thing as a faithful copy. 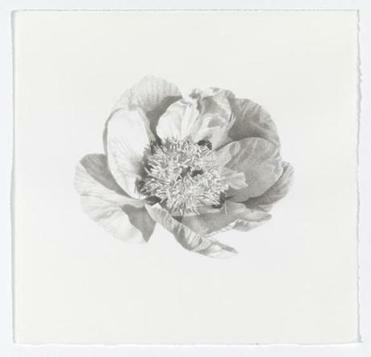 Alexander’s exquisite drawings of peonies trace a flower’s life from bud through blossom. They stop the hurtling of time, so quick for a spring bloom. For “Beaver Stick,” she drew an unremarkable oak stick from every angle, as if embedding it in her memory. Only then did she make the stick her own, covering it in gesso, drawing over it. In everything here there’s a tension between accurate reproduction and its loving attention to detail, and a larger truth that seeps through in the artist’s gestures. Sarah A. Smith’s technical wizardry and opulent material — imitation gold leaf — make her drawings at Beth Urdang Gallery worth viewing even in the poorest light. Smith applies the gold leaf, and then selectively tarnishes it with a corrosive. The pieces gleam and gutter like a dying candle flame. That’s a lot of visual might to deploy. What she’s saying with all that muscle isn’t clear. Boldly, Smith makes flourishes that reference musical notation, musical instruments, foliage, and feathers — thrillingly unpredictable cross-references. Many of her images, as in “Eagle vs Wolf” and “Mountain Lion,” feature animals ensnared in wire with hawks perched nearby, perhaps controlling the snares, or at least connected to them but seemingly unharmed. If there’s an allegory here, I don’t quite get it. Is the eagle a metaphor for the United States? Are the trapped animals stand-ins for nature? Are the hawks tethered, or snagged, or free? The images are visually vivid — Smith has mastered her exacting craft — but story-wise, they’re muddy.